This article was first published at Gates of Vienna. For the International Civil Liberties Alliance, the theme for this week’s OSCE in Human Dimension Implementation Meeting in Warsaw was “Bad Definitions”. As readers have undoubtedly noticed, the most prominent bad definition is the word “Islamophobia”. There are plenty of other words than can be targeted as ill-defined, and those have been discussed here in earlier posts, and in the ICLA paper “The Problematic Definition of ‘Islamophobia’”. 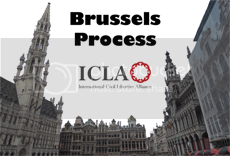 However, to make matters simpler, the ICLA team concentrated this week on “Islamophobia”. On Tuesday night the ODIHR Tolerance and Non-Discrimination Department convened a side event, “Educational initiatives and approaches for addressing anti-Semitism and intolerance against Muslims”. This sounded like a worthwhile opportunity, and a large contingent of people from ICLA, Bürgerbewegung Pax Europa, the Center for Security Policy(CSP), the Stresemann Foundation, and other anti-Shariah NGOs decided to look in on it. It was a good thing we did. It turned out that the side event was convened to highlight “Guidelines for Educators on Countering Intolerance and Discrimination against Muslims: Addressing Islamophobia through Education”, which was published jointly [pdf] by OSCE/ODIHR, the Council of Europe, and UNESCO in 2011. This document — which contains 49 instances of the word “Islamophobia” — was discussed in the ICLA paper, and was part of the focus of our research. The first forty minutes or so featured presentation by the panelists, including some of the authors of the “Guidelines”. One of them was a British gentleman named Robin Richardson, who is associated with the Runnymede Trust. Among other things, Mr. Richardson told the audience: “We all know that nations are not capable of solving the world’s problems.” Only global institutions were capable of doing so. His assertion was the last straw. Since the panelists had repeatedly mentioned “Islamophobia” — ICLA’s topic for the week — I decided to speak up. After comments by one other member of the audience, I had my say, and a lengthy discussion ensued, capped by devastating remarks made by Major Stephen Coughlin of CSP. The full audio of the final 48 minutes is available here, and a complete transcript of that audio is at the bottom of this post. Ned May: Thank you, Mr. Moderator, about how long do I have to speak? A couple of minutes? Moderator: A couple of minutes. Ned May: Okay. Thank you for this opportunity. And I’d like to thank my esteemed colleague from Belgium because I can’t help but agree with her. We need new terminology. 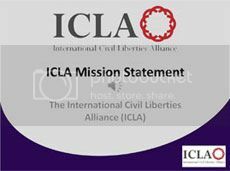 On behalf of the International Civil Liberties Alliance, I formally object to the use of the word Islamophobia. Any official use, including this document. It is ill-defined and was undefined for four years. We requested a definition for four years. And it’s not even defined in here. And when we finally got one, it was from the Turkish delegation this year. And it was based on a definition by the Organization of Islamic Cooperation. That is a clear conflict of interest, to use a definition by an Islamic body of something that is used against non-Muslims. That’s the first problem. The second problem is the definition itself as our extensive, well-sourced paper showed, has at least thirteen major problems including six logical failures. It cannot be used. And the biggest failure is that the definition calls Islamophobia based on unfounded fear of Muslims or Islam. That itself is difficult to prove in any given circumstance. And any researcher who attempts to prove that someone has a well-founded fear of Islam is branded an Islamophobe. That turns the word itself into a Catch-22. It is circular; it is recursive. The word must be defined through the agreement of people who share different points of view: those who object to Islamic law, those who support Islamic law, those who have no opinion. It must be defined by Christians, Muslims, Jews, Hindus, Buddhists, atheists, agreeing together what Islamophobia is. Otherwise, it should be abandoned entirely. Stricken from existing publications including kept out of future publications. Thank you. Bashy Quraishy: We have been asking OIC for years and years now not to call it intolerance against Muslims when they call it anti-Semitism, they call it Christianophobia, they call it everything — if Muslims want to call it Islamophobia, it is none of anybody’s business to call it something else. Thank you very much. Robin Richardson: I’ve got lots to say, but I’d like to hear other people, I think. It’s true that I was working for the Runnymede Trust. And the report — the definition which our friend mentioned was from the Runnymede report. But we had a huge argument at the time about it. We didn’t invent the word. And we did the best we could to define — to describe, not to define — we were describing. And we had that big argument and there’s been an argument going on ever since in academia. There’s huge academic literature on all this. And I do agree with our friend from Belgium, terminology is difficult. We’ve only got the words from the past. Human beings make their own culture as somebody once said — or make their own history. But always with conditions inherited from the past, a very famous statement about human nature. We’ll talk on — we’ll let other people talk for the moment. Robin Richardson: Just finally, I do agree that terminology is important and we’ve got the wrong terminology. But there’s nothing new. Ever since human beings have been talking to each other, we have not had adequate words, never and never will. We do our best with what’s there. There are lots of languages and we learn from each other’s languages. From each other’s struggles and so on. So I’m not ashamed that our language isn’t good enough. The key thing is to work on getting better language. But, as I’ve already quoted, the great philosopher once, and without naming him, I might name him another time, it’s not Groucho Marx, but somebody with the same surname, but he said the task, philosophers have interpreted the world, the task is to change it. And we need language to interpret the world and to some extent we need language to change the world. But all the same, language doesn’t really change the world. It changes how we see it. And I agree with — when you, you’ve got to make choices and continually you have to make choices, and suddenly the word Islamophobic was originally a French word so far as scholars can work out, came in at about 1910, it appeared in English in the work of an American Christian writer in about 1985. That was the first known use in English. So it’s not a Muslim word, actually. But when you’ve got to make a choice, well, some of us choose to be on the side — I’m sorry to be histrionic and passionate about this, but some of us want to choose to be on the side of those who are suffering, those who are harmed and hurt. And people are being hurt and Islamophobia is as good a word as any to describe what it is that’s hurting them. But it’s not perfect. Umut Topcuoglu: Thank you very much. It’s not a question, but rather I just want to clarify a point. My name’s Umut Topcuoglu, I’m from the Turkish delegation and first of all, thank you for this very interesting side event. In fact, I waited until the end, because I didn’t want to interrupt the flow of comments, but I did hear my delegation being mentioned by the representative of the International Civil Liberties Alliance and I just wanted — and we’ve talked about terminology, so I won’t be going into that, I just wanted to clarify one simple point. You, sir, mentioned that the Turkish delegation provided a definition of Islamophobia which came from the Organization of Islamic Cooperation. Now I’m sure I have really stated this before, the definition of Islamophobia, my delegation provided in some previous sessions or meetings on tolerance and non-discrimination was formulated by a retired Turkish ambassador, Mr. Ömür Orhun Now this retired Turkish ambassador was between the years 2004 and 2008 personal representative of the chairman in office of the Organization for Security and Cooperation in Europe on intolerance and discrimination against Muslims. So we have here, of course, right now he’s special envoy to the chairman, the secretary-general of the OIC. But the point is that the definition was formulated by someone who has deep experience in these affairs and who actually worked within the OSC in these affairs, so I think saying it’s an OIC definition is really sort of distorting the facts. I just wanted to let you know that. Bashy Quraishy: Can I just add, very quickly, the information of the delegates and for the speaker, in the last five years, there has been six international service by Amnesty International, fundamental rights agency, open society, European [UNCLEAR] and hundreds of others who have clearly documented the discrimination, prejudices, violence, hate speech, which is being, you know, used against Muslims, so we cannot just say that it is just what our own idea — it is very well documented and I can give the name, the link of the reports to [UNCLEAR] like to have. Thank you. Moderator: Thank you. Now we have last intervention and then we will have to finish. Stephen Coughlin: Yeah, my name’s Steve Coughlin. Center for Security Policy. The name of this forum has the word Islamophobia and we’re talking about a publication that concerned itself with Islamophobia when asked for a precise definition, and I did an intervention today where we’re calling for that. It was precisely because it’s a term that stereotypes people for the purpose of attacking them. Which in theory is exactly what this concern for Islamophobia is supposed to be countering when they do it. We’re being told there is an epistemic reason that we cannot linguistically arrive at a definition of this. We’re told that we’re supposed to rely on these international authorities, that they bought off on it. But what I saw today was a refusal to give a definition, and I think in large part because you can’t. Now the thing about it is, the term Islamophobia is applied to people for the purpose of attacking them. And so I noticed, sir, you brought up the fact that you work for Runnymede. It’s not lost on me that the OIC’s observatory publications, annual observatory reports, relies on Runnymede for the terms that they go after to attack people. And in fact, I just pulled one up right now where they’re quoting Runnymede. So I think there’s something just not quite right about how this discussion is going. I mean, all people asked was that you define the term you’re going to use to attack people, when you attack them, when it’s clear that the OIC has observatory reports to go after people for doing exactly that. Robin Richardson: Just could I come back, I don’t think the word Islamophobia appears in here. It appears on the title. Ned May: It’s in there forty-nine times. Ned May: The Runnymede definition is in here. Robin Richardson: I’ve never used — I have never used it to attack people. Moderator: We — sorry, one response to that, we encourage critical thinking, open discussion. There is no suggestion, no suggested educational approach to attack people. If you read the guidelines carefully, you would find that we encourage not to — when there is a manifestation of intolerance against any group, it’s not a good approach, pedagogical approach, to even accuse a student of being racist immediately. Stephen Coughlin: I didn’t ask you to reach an agreement. I asked you just to define your terms. Can I just take it that you’re not aware that the OIC publishes annual reports and now monthly reports on Islamophobia for the purposes of bringing action against them? So you’re not aware of that? Moderator: You can mention — you can talk about this issue with the authorities of OIC. This is not the right place. Thank you. Yeah? Below is a transcript of the full audio, mostly raw and unedited, with some of the times included for reference. Robin Richardson: — wish to comment on that. Bashy Quraishy: My name is Bashy Quraishy I am at the University of [UNCLEAR] which is Muslim Initiative for Social Cohesion. By the way, for record, I am not a religious person. So that should be said. I have been involved with Robin from the beginning for this course for talking about Islamophobia and anti-Semitism and I’m very happy that [UNCLEAR] has got that wonderful results, which were supposed to come at the time. Having said that, I would like to say something about this terminology thing. The people who are suffering the hate crime against Muslim, the discrimination, they are Muslims. They are not — they are not Christian, they are not other ethnic groups or other religion. So please, for democratic sake, let the Muslims at least accept and use this terminology and I can tell you my organization has been working on this. We have a very clear definition. And I will tell the gentlemen who spoke before me, this is not OIC who has funded it. Who has made this definition. It is NGOs, Muslim NGOs in Europe. And even before that, actually [UNCLEAR] came out of this very clear definition of that, I am sure you will talk about that a little more. So I would request that let the Muslims at least be charge of, you know, their own faith in Europe. What I — a question to Robin and people who work anti-Semitism and Islamophobia is that there is a lot of work being done on the educational level, on the NGO level, but what I’m missing actually is that we have done very little work about the internal prejudices which Muslims have about Jews and which Jewish people have about Muslims. And I work with those issues for many years and I know there are lots and lots and lots of — some are political, some are religious, and some are historical. So I think our next project maybe OCG [PH] can make is on that issue. Because we need to raise awareness among Muslims that we are in the same boat, but at least we can talk about that. And if we don’t talk about that, then we will never, you know, go further. It’s very — and the last thing which I will say is that the media plays a very, very important role in spreading Islamophobia and anti-Semitism. And the politicians also do that. Woman: Yeah, I will try to be brief. Yes, absolutely, about the need to work in our communities specifically between Muslim and Jewish communities on anti-Semitism and Islamophobia. Absolutely important. And we’re working with the training in bringing those two groups together. So we’ve done a project together before and we’re happy to do more, so I welcome that. And while terminology is important, what you name things does have meaning, at the same time, we have to be careful not to get stuck on that and move forward on what we’re living and the reality. So I think certainly describing what you mean by that term and setting the context is always important and something that we’re certainly doing in the trainings. I would also — just to clarify that, I don’t think I used the word tolerance, I used the word intolerance. We aim for respect. Of course, it’s very much the very least — at least tolerance. But that’s certainly not the goal and certainly not the concept that we’re promoting. But recognizing that intolerance exists does seem still appropriate recognition, from me, from my perspective. And while I mention that the terminology is a challenge and we decided — we could have been stuck in debate for a very long time before actually implementing the training, the training program. And we did have the issue of our Muslim partners and individuals and trainers who have been good partners and good trainers and working together on all of the issues and they said, if you change the name — because we have the right to self-define and I mean, anti-Semitism, as a term, if you look at the whole root, it’s not a perfect term either. Homophobia is not a perfect term either. We have to also move forward, not to say that there aren’t problems. I understand the French were talking about Muslim — it’s hard to say, mujamanaphobique [PH] Right? [BACKGROUND VOICES] I’m supposed to speak French, but that’s a hard one still for me, so Muslim-phobia, so there is — that’s work to find the right term. But in the meantime, let’s deal with the matters at hand and that was a decision that we took as an organization. Woman: It’s not a people. It’s a language. Woman: Exactly. And so anti-Semitism is really a very, very difficult term also to use. But this is already since more than a hundred years, the term is for Jew hate. So if we are clear on terminology, we have to be very clear when we speak about it. I would like to say just a few words about this inter-community dialogue or whatever we should call it. In Sweden, there are maybe eighteen thousand Jews. And there are several hundred Muslims. So there is inter-religious dialogue. But it’s very, very difficult to get inter-community dialogue everywhere in Sweden. So we have to deal with this in a different way. And among the teachers in Malmö, there are I would say very, very many teachers with a different background. Different ethnic background. So in doing the teachers’ seminar in Malmo, we are in a way dealing with this inter-group dialogue in a way. [BACKGROUND VOICES] Yeah. Moderator: Thank you. As all of our speakers made very clear, it’s — we shouldn’t start with all this terms, we should deal with this issue. The phenomenon. So please if you have any other comments, if you want to talk about other issues, then the terminology, the floor is yours. Could you please introduce yourself? Man: Thank you, very good. I think it’s, say it’s 2006 that we are trying to work on this issue and after many, many years, all of these — of some other organizations and inter-governmental organizations, its activities, this situation is not better but worse. That’s why I’m happier about this program and you know that I try to — to support that. You know, there is, for us, for [UNCLEAR] and for — it was the case for [UNCLEAR] also there, we are talking about people, real people. And most of them in Europe today, they are working all of life to build some countries after the second World War. They are only trying to live peacefully and the believe in Europe because there is some worries as Kamal said. And the big challenge is for us today to protect these values. Because it’s targeted by the people or some of them who build it, and the challenges about some people who are targeted in cities, in the streets, in their homes, in their worship place, and that’s not acceptable. The challenge is not difficult in reality. It’s easy to see that some people who are walking the street are targeted by it. You know, you can talk about terminology, but what Breivik is doing in Norway is not terminology. It’s about real people who are not between us today. That’s our problem. Problem like the problem in Pakistan yesterday is also our problem. And [UNCLEAR] know that. As, you know, the big challenge of Europe, the biggest challenge, is about values, democracy, etceteras, etceteras. We are talking of that since years and years. It’s about equality and the possibility to include Muslim communities, are equal citizens. That’s the challenge. And if Europe and European people and also the people who are afraid about this new presence can do this challenge that Europe, our Europe, may be much stronger. That’s the only question. Thank you for that. And I’m very happy because two weeks ago in Istanbul, we organized the big conference on Islamophobia through law and media and they made an interesting report which is now for years was one of the main tool that we used. Thank you very much again for that, Robin. Moderator: Thank you, [UNCLEAR] now I will give the floor for the reflections of our speakers. But it’s important to have this civilized conversation. It’s — of course, people don’t have to agree on everything. But it is important that we have such discussions in a constructive and civilized way. As to how to addressing the — how to address Islamophobia and anti-Semitism, first I want to underline that when we developed, when we drafted the guidelines for educators on intolerance and discrimination against Muslims, we underlined the key principle that the educational approach in addressing intolerance and discrimination against Muslims should be human rights-based. So the whole approach that we adapted is the same for intolerance against Muslims, the same for anti-Semitism. It’s all about human rights. Equality, freedom, justice. It’s not about religion, it’s not about Islam. It’s not about Judaism. And whether that can be in parallels between Islamophobia and anti-Semitism, we are not suggesting this. Of course, the history of anti-Semitism is totally different than the history of Islamophobia. That’s not the issue. The issue is to build partnerships, to build coalitions, to create platforms, to address all forms of intolerance in their own specificities. I think that this doesn’t mean that we are establishing any parallels. We acknowledge that the history of anti-Semitism is quite different than the history of discrimination against Roma and all the other people. And it is very important, in order to address it, educate the — challenge those stereotypes, you need to acknowledge the specificities of those different forms. But I’m not going to talk too much about this and I will give also the opportunity to our speakers to reflect. Maybe if Robin, you would like. Woman: Well, I would just recall, basically, what’s been said and recall a little bit the beginning of the presentation which I made which is we’re taking an anti-bias diversity training approach, right, which is looking at diversity in a very broad way and building the foundation is the very first step which includes values and participation as key skills and attitudes to have in dealing with each other. And then I talked about diversity of religion and belief as a training program. And there was — and how to bring believes and non-believers across the various groups in order to address the issues of living together. And I have to say, one thing I didn’t mention before wasn’t only about the believers and non-believers, but how do we also make a place for those who are invisible, basically, right, who are not usually mentioned, such as Sikhs, Hindus, Buddhists, new religious movements, we heard also from Jehovah’s Witnesses earlier today who made several statements and those who don’t quite fit anywhere, even if there may be some religious, cultural belonging, right? Who are eclectic. Where are they in that? Right, so a religious diversity approach is inclusive of everyone to have their place and to talk about questions of values and how do we live together. And then there are specificities to each. So there is a program on anti-Semitism. And we have a program on Islamophobia. And I mentioned, also, some other programs. And then there is a place and a time to do them in a dialogue kind of thing together so that people can be in solidarity because we know that there are issues of anti-Semitism in the Muslim community. We know there are issues of Islamophobia in the Jewish community. And sometimes we need to deal with them also together. And they are a relationship, so that it’s not escalating either one or both anymore. Woman: For our organization, though we are called Swedish Committee Against Anti-Semitism, it’s very, very important to be consequent, consequent against prejudice, consequent against — my English is not so very good here, but to be consequent, to always stand up for whoever is persecuted. We made a statement about I think, some of you know, there has been a registration of Roma in Sweden, for instance. It’s turned up a register in the police in Skåne and they have registered Roma population. Four thousand, two hundred Roma, something like that, even small children. So we made a statement, we actually made a statement immediately. And so for us, it’s very, very important. And the prejudices against the anti-Semitism and Islamophobia is not present in Jewish and Muslim group and it’s not the Jews who are anti-Semitic, so we don’t target the Jewish group, of course. It’s us, it’s the other people, of course, we have to deal with. And not to — so, for us, we don’t have any specific — we are not a Jewish organization, we are a human rights organization. And so for us it’s not a problem. Moderator: Okay, thank you. Still, we have some time and maybe I can take some more questions — okay, first, you and then the other person. Could you please use microphone? Man: So I am from the [UNCLEAR] Centre, Budapest. Which is, I can probably say the only city which is lucky enough that after the whole [UNCLEAR] still has a large Jewish population. But also it has, as we heard, and I was sort of — I felt really bad that it’s through that, it’s a very disturbing thing that’s still — anti-Semitism [UNCLEAR] prejudice and hatred is widespread. And so my question is that in what way is you think we can include in the education to afford to fight that and push back that ignorance in a way that go deeper than just teaching tolerance and I would add appreciation of minorities, but which would sort of alter the whole underlying narrative of those nation-states where such prejudices, mostly out of ignorance, but those who are just negative elements of the national narrative, can sort of exist. So what I mean and then I finish is just to add one point, that in Hungary the context is really specific and it cannot be understood without knowing and understanding how Jewish Hungarians in the Austro-Hungarian Empire played a very important part in modernizing Hungary in collaboration with the transitional Hungarian aristocracy and noblemen. So that’s a special role Jewish Hungarian played and then if somehow that is not part of education in a clear way, then people might say, oh, what is this kind of two influential role some Jewish people played in Hungary, then of course, that fits all sorts of prejudices and so forth and so the question should be, how do you think educational effort can include changing the national narratives that sort of accommodate prejudices based on, of course, a lot of ignorance. Thanks. Woman: Thank you. Thank you very much for you question. As it happens, I mentioned we have the fifteen country versions of the teaching materials on anti-Semitism. They come in three themes. One deals with traditional anti-Semitism only, the history of anti-Semitism. Theme two deals with contemporary manifestations of anti-Semitism and theme three touches on intolerance in general and questions of discrimination and identity. We have a Hungarian version of this tool. It was developed in cooperation with the Sahov [PH] Foundation. And we will present it at a forthcoming conference at the beginning of October with the Tomland [PH] Institute in Budapest, so you’re welcome to find out more about the specific tool there. I think drawing on the wealth of experience that we have in dealing with this topic, anti-Semitism, in fifteen countries in educational context, I said, actually it helps to bring in a multilateral or European perspective to overcome all challenges related to potential national narratives, as you mentioned. And I want to give you an example. We’ve implemented these materials extensively in Ukraine and we’ve worked with the Ukrainian teacher training organization that has developed very interesting methodologies of presenting these tools to teachers and we made it possible that a Ukrainian trainer attended a teacher training in Hungary. To just talk to Hungarian teachers about his experience in Ukraine, about overcoming anti-Semitic prejudice through this tool and I hear back from the Hungarian colleagues that it was a very powerful message. To hear that, yes, anti-Semitism is a problem in Hungary, but it is also a problem in Ukraine. It is also a problem in Germany. It is also a problem in Sweden. So the teaching materials that Lena was talking about refer back also to the European dimension of the problem and tie that back into the national approach with national examples. And from what we can tell, this is a helpful way of also overcoming the resistance that some teachers may have, as some experts mentioned, the resistance, first of all, of engaging with such materials, but also engaging with their own prejudice to hear that it’s something that is a challenge in other countries as well and there are multilateral, international narratives that seek to address these challenges. These materials also contain examples of Jewish history in each country, but also in the European dimension, so it touches on both the history of anti-Semitism and also the history of Jews in Europe. And I hope that answers the question. Moderator: Thank you. There was another question. Moderator: Could you please introduce yourself? Felix Strüning: Okay, yes. My name is Felix Strüning I’m from the Stresemann Foundation based in Germany. So let’s don’t talk any longer about terms, but if we look at this booklet about Islamophobia, this is maybe the following questions mainly to Mr. Richardson, as a political scientist, I have some questions to the source or to the arguments delivered there. I only take up four short ones. They will not be much more. First, you talk about a widespread discrimination and intolerance towards Muslims in Europe. I’m quite into these studies. And they say directly the opposite of course there. But mainly against the people of, let’s say, the peoples of Europe mainly are against Islam as an ideology. And not against Muslims as believers. This is what most of the studies found. Second, maybe I have a different one. Second, this brochure says, if they are stereotypes, which for sure are, they lead automatically to discrimination. This is not true. Maybe it’s likely, but it’s not true. Psychologists can tell you a lot about this. Third, you mention several sources or roots of resentments against Muslims in this brochure, like the war on terror, the economical crisis and so on. But what you never mention is what could be also a root source or a root for resentments, yes, the Islamic legitimized terror. That or missing integration of Muslims in Europe, in the European societies. And the most high crime rates among all the migrant groups all over Europe. First, and this is my concluding point the pursuit of [UNCLEAR] special rights for Muslims, for instance, in schools. And as far as I know, we don’t have group rights in Europe, in our constitution of the states, we have only individual rights. So group rights is maybe not state of the art. So maybe you can comment on this, too. Thank you. Woman: So just a technical question or comment, as far as I’m aware, Germany doesn’t collect the statistics based on ethnicity or religion. How do you have the data? I would like the source, because I’m doing research relevant to this. Where do you get the data about the highest crime rates among Muslim communities?